The small constellation Noctua spans just five degrees between 15 and 20 Scorpio. Noctua is the species name of the Little Owl, Athene noctua. The genus name comes from Athena, the Greek goddess of wisdom. Athena’s Owl was called Glaucus, Greek for “glaring”. The Little Owl does have a stern expression. Glaucus sat on Athena’s blind side so that she could see the whole truth. The owl can turn it’s head right round, looking behind to find the truth through hindsight. The German philosopher Georg Hegel referred to Glaucus to explain his idea that philosophical understanding can only come from hindsight: “the owl of Minerva spreads its wings only with the falling of the dusk”. Minerva is the Roman equivalent of Athena (asteroid Pallas Athena). 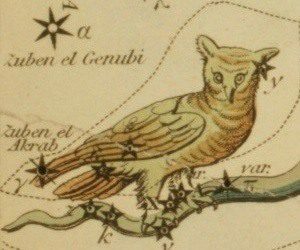 In astrology, the constellation Noctua is fortunate, giving honor and ambition. Owls are are vigilant predators and this comes through as a killer instinct, fixity of purpose and steely determination. Wisdom, both spiritual and intellectual, comes through contemplation of their experiences. Mary Shelley (rising) touched on spiritual wisdom and fixity of purpose with “Nothing contributes so much to tranquilize the mind as a steady purpose, a point on which the soul may fix its intellectual eye.” Maggie the “Iron Lady” had a stern glare, but tennis champ Chris Evert earned the title “Ice Queen” with her fixity of purpose and stern expression. Others with their Ascendant in constellation Noctua include astrologers Jeff Green (with Venus) and Robert Pelletier. Jacqueline Kennedy Onasis (with South Node), Evonne Goolagong Cawley, Michael Douglas, Clint Eastwood, Sarah Ferguson, Aretha Franklin, Prince, and Johnny Weissmuller. 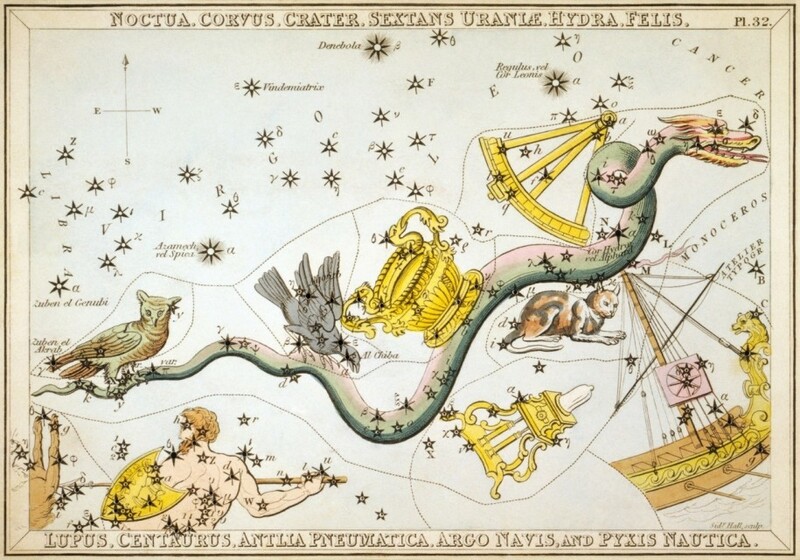 Constellation Noctua is made up of six small stars in the tail of the Watersnake, constellation Hydra. Al Corni is the claw, Al Janah the wing, Cor Noctua is the heart of the owl, and the two stars either side of the heart are Vigilis Borealis (Northern Guard) and Vigilis Australis (Southern Guard). The unnamed star a couple of degrees away is in the tail. Thanks to David Lee for the positions of the stars: The Little Lost Constellation. Moon conjunct Al Corni. This adds a very nice dimension to my understanding of my Scorpio Moon. Thank you! Oh! So good to know! It appears as conj. NN, which saves the not-so-nice other ensaladas between my 11th and 5th house. Now, I know why the vidents say to me that I always have to reflect lots! Funny, a friend sent a pic of an owl today. I think this star is cool. How do you think the mars transit affects this constellation, and what about the up and coming Saturn transit? Good question Nikki. I’ve noticed that I seem to research things when they are being triggered by transits. Looking into asteroid Pallas with it conjunct Uranus. Not planned, but researched Noctua with Mars there. Been looking into comet C/2012 S1 ISON and Saturn will be in Noctua in December 2013 when the comet is closest and predicted to be very bright. In a very unpredictable and let´s say naïv way, I find that both of you -Marina and you- have an amazing way to see what´s comming and to keep us in the track. And for me, it is very easy to feel the inner or sorrounding energies, thanks to the readings. In all, I feel like having a map -like Marina says (and me to my self) or a compass- then it is easier to face reality -or even dreams- with this sensing and sensitive knowledge. Not that I manage it like a magician (I have this challenge in this life, according to mayan oracle), but I seem to interact within, with others and my surroundings in a more subtile way. I feel that you connect with the comming skies, and also with you intuition! My Athena is in my 10th house, and I have so many times felt that I am more my father´s daughter, than my mother´s. And then, her owl Noctua is conj. my NN, close to the Moon, my mother´s funny energies (5th H. Saggitatius), inviting me to be light AND thoughtful. Both. For me, it is like this integration, the inner one, which is very important for each one of us. Or at least, for me! I have this influence too on my Neptune. Jamie, it’s interesting how much the photo of your eyes here looks like the owl’s eyes! Thank you Jamie for introducing the Fixed Stars of the Constellation Noctua. Since Asteroid Juno is the patroness of long-term commitments, relationships and true love, the stressful aspect with my Moon indicates conflict between emotional and partnership needs. and the fortunate nature of Cor Noctua turns out to be very beneficial to me! Indeed, wisdom in truth is found in the very heart of Noctua the Owl. Thank you both for sharing your valuable insights. Working all night long, self-hypnosis yeah it’s great. Right on, Jamie. Hi Gloria, use the free chart maker to find the degree of your Sun and other planets if you want. Then check down this list of star. Noctua is not used anymore and I have not included its stars in that list. But any planet around 16 to 21 degrees Scorpio will be in the Owl. Also, asteroid Pallas Athena has an association with owls. You would need to use the extended chart maker to find Pallas in your chart.